The laws of nature are written by the hand of God in the language of mathematics. 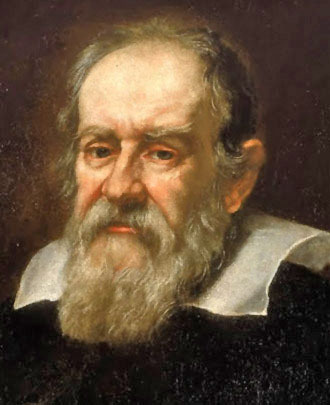 Galileo Galilei (1564 – 1642) was a brilliant mathematician, astronomer and physicist. He was appointed to the chair of Mathematics at the University of Pisa in 1589, and spent the next 20 years conducting excellent astronomical observations and making significant discoveries in pure and applied science. He did groundbreaking work in the mechanics of falling bodies under gravity (although, contrary to that other myth, he never dropped anything off the Tower of Pisa), and made significant improvements to the design of telescopes. In 1610 he published his observations of the moons of Jupiter, and it is at this point that our interest in him really starts. Astronomical understanding in the early 17th century was still rooted in the Aristotelian model, the core of which was that the heavens were composed of concentric circles, with the Earth at the centre. The celestial bodies themselves were perfect circles made of “incorruptible aether” and were eternal – subject neither to generation nor decay. This was the reigning scientific model which the secular universities were adamant to maintain, but Galileo’s observations of sunspots and lunar craters cast doubt on the “perfect circles”, and his observation in 1604 of a supernova contradicted the immutability of Aristotle’s heavens. Moreover, his observations of Jupiter’s moons challenged the notion that all celestial bodies orbit the Earth. 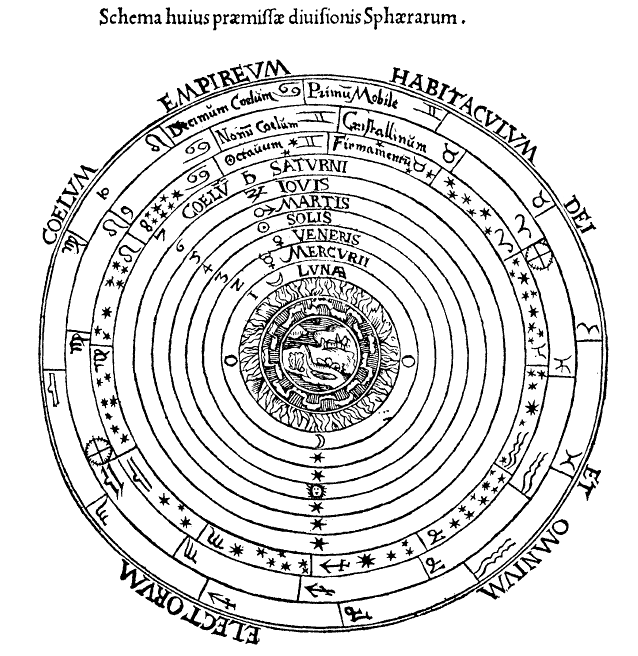 Galileo endorsed the heliocentric system developed by Nicolaus Copernicus, a Catholic priest who published his De revolutionibus orbium coelestium in 1543. In 1611 Galileo travelled to Rome to present his findings, and was greeted with great acclaim. He demonstrated his observations of Jupiter to Christopher Clavius, a Jesuit at the Collegio Romano and the most respected astronomer in Europe at the time, who confirmed Galileo’s observations and parts of his theses of planetary motion. The secular university professors were not as accommodating to this activity as the Jesuits had been, however. After several years spent as a public advocate for the Copernican theory, Galileo wrote in his famous Letter to the Grand Duchess Christina in 1615 that his theories had “stirred up against me no small number of professors”, and that these academics had agitated strongly for ecclesiastical support in their cause. In effect, he challenged Galileo to offer some proof for his theory or stop pestering the Church publicly with it, but that if proof were offered he was open to hearing it. Galileo had no astronomical proof to offer, partly because his own observations did not align properly with his theory. He insisted that planets move in perfect circles (based on Aristotle’s hypothesis) and rejected the theories of Johannes Kepler, who proposed in his Astronomia nova (1609) that planetary orbits are elliptical. Instead, Galileo proposed as proof a flawed and unconvincing theory that the tides were evidence of the Earth’s rotation (and, incidentally, specifically denying that lunar attraction was involved). In 1616 the Church ordered him to cease and desist his public advocacy of the unproven theory. For the next seven years, Galileo acquiesced to the Church’s injunction, but in 1623 his friend and supporter Maffeo Barberini ascended to the papacy, and Galileo confidently re-entered the public fray. In the same year he published Il Saggiatore (“The Assayer”), in which he launched a vicious assault on a treatise on comets by Orazio Grassi, a Jesuit mathematician at the Collegio Romano. Grassi used observations of parallax to argue that comets are further away than the moon; Galileo ridiculed this idea and claimed instead that comets are an optical illusion. His factual error notwithstanding, the harshness of Galileo’s tone permanently soured his relations with the Jesuit order. Pope Urban VIII thoroughly enjoyed the rhetorical flourishes of Galileo’s prose, however, and composed a poem in his honour. Like Galileo, Urban was a vain and irascible man. After listening to Galileo’s arguments for years, he declared that the possible ways of arranging the universe were so numerous that it was impertinent for mortals to claim that they had discovered the unique truth. He insisted that Galileo include the Aristotelian alternative in his presentations of the universe. In 1632, Galileo published his response to these arguments: Dialogue Concerning the Two Chief World Systems. In it, he presented his astronomical theories as a conversation between Salviati, who is referred to as “the Academician” and represents Galileo’s own views; and Simplicio (or “The Fool”), who bumbles about and contradicts himself as he ineptly offers a straw-man version of the Aristotelian / Ptolemaic perspective – and more importantly, represents the Pope’s views. Not too surprisingly, this didn’t go down very well with the Pope. His hubris and vanity would not tolerate public ridicule, and Galileo was called before the ecclesiastical court. He was condemned by the Catholic Church as “suspected of heresy” – about the strongest charge that could be brought, since Copernicanism had never been declared heretical – and was then whipped tortured killed burned housed with a personal valet in a luxurious apartment overlooking the Vatican gardens. He spent the remainder of his life in comfort (albeit technically under house arrest), working on his final masterpiece, Discourses and Mathematical Demonstrations Relating to Two New Sciences. Published in 1638, this book was the grand summation of much of his work in physics over the preceding thirty years. First, the obvious: Despite the fact that prominent atheists love to invoke Galileo as an example of the supposed “conflict” between science and religion, Galileo was a Christian. He responded from a distinctly Christian perspective to the secular professors who attacked his theory; in Letter to the Grand Duchess he invokes arguments by St Augustine and Thomas Aquinas regarding Biblical interpretation. Although today we view Galileo’s theories as an obvious improvement over the Aristotelian model of a geocentric solar system, it is important to reiterate that this was not provable by Galileo’s own evidence. His observations of the moons of Jupiter and the craters of the moon suggested problems with the pure geocentric model, but he certainly could not prove his case. In fact, an objection could have been made on purely scientific grounds that the heliocentric model offered insufficient improvement in explanatory power to justifiably replace the reigning paradigm. What is often overlooked is that “science” in the early 1600s was not considered to be the matter of life and death that it is today. The primary purpose was to explain observations in a formalistic sense: it was merely a means of coordinating data, and was viewed as having no bearing on the ultimate reality of things. In short, it was regarded as a diversion for academics, and many in the church were genuinely puzzled that they had become embroiled in an affair concerning two mathematical models. But for those interested in further details about the scientific merits of the case, let’s look a little more closely at those details. The vital point of “conflict” that we must investigate is the 1633 trial which led to Galileo’s house arrest, and the book which instigated that trial, his Dialogue Concerning the Two Chief World Systems. The scientific merits of his arguments in that book, I believe, are key to evaluating whether the conflict itself was based on primarily scientific or theological (and possibly personal) grounds. The Aristotelian/Ptolemaic system, with everything orbiting around a stationary Earth, which had largely fallen out of favour following Galileo’s observations. When asked by the Pope to “represent all sides of the argument”, Galileo’s response was to ridicule the Aristotelian system (and ridicule the Pope at the same time), strongly argue for the Copernican system an omit the Tychonic system entirely. It is because of this vital point that his treatment of the Aristotelian system is regarded as a classic case of straw-man argument. The important point about his omission is this: The Copernican system (which Galileo represented) and the Tychonic system (which the Church favoured) are mathematically identical for all observations available at the time. The Tychonic system only fell out of favour theoretically after Newton’s theory of gravity (published in 1687) made it inconceivable for the solar system to orbit the small mass of the Earth, and was only challenged observationally by James Bradley’s observations of stellar aberration in 1725. Proper observations of stellar parallax were first made in 1838 by Friedrich Bessel (for the star 61 Cygni). It is often argued that Galileo’s scientific theories were being silenced because they were opposed to Church doctrine, but I believe that a closer examination of his argument reveals a different story. His arguments for the movement of the Earth were not scientifically valid, and thus the Church’s decisions against him cannot justifiably be viewed as anti-scientific. Rebuttals to traditional objections to the movement of the Earth, such as thought experiments of relative motion. Observational evidence that refutes the Aristotelian/Ptolemaic model. Some of these (such as the phases of Venus) are valid, others (such as his theory of sunspots) are incorrect and do not illustrate problems with the older model. Arguments that discredit the Aristotelian notion of a “perfect celestial order” full of unblemished spheres. These include observations of sunspots and the irregularities of the Moon, but do not have any relevance to the issue of the movement of the Earth and Sun. An attempt to explain the tides as direct evidence of the Earth’s motion. We note immediately the scientific thinness of his argument, as well as the straw-man nature. By deliberately ignoring the Tychonic system he avoided having to deal with the fact that there was no observational evidence by which he could definitively say that the Earth moves. Particularly important to note is the tidal argument. In Day 4 of the Dialogues, Galileo attempts to use the tides as “proof” that the Earth moves, which is not only incorrect, but also in direct contradiction with his earlier arguments about relative motion. His logic is internally inconsistent and offers a new theory which has no more power to explain the observations than the current (Tychonic) paradigm. His argument for its advantages over a system that serious astronomers didn’t even use anymore is irrelevant, and so, scientifically, his theory was too weak to be accepted. (Without the tidal arguments, his model would stand as an observationally equivalent hypothesis to the Tychonic model; with those arguments the logic is inferior).